We are very grateful to Karen Fill who provided most of the photographs shown here and a great deal of the information we have about her husband’s family, especially about the children of the Fill family. Thomas Fill was born in Great Yarmouth in Norfolk on 1st April 1840. The 1841 and 1851 Censuses show that he was the son of a warehouseman (and later a ships’ chandler), James Fill and his wife Mary Eleanor, and that they lived in Great Yarmouth. The 1861 Census shows that Thomas had become a National School master and that he was lodging in Herne. He married Fanny Yoell in St Leonard’s Church, Streatham on August 7th 1865. Fanny had been baptised at this church in Streatham on 24th June 1846. She was the daughter of George Yoell and his wife and Ann (nee Fletcher). The 1851 census shows George was a painter’s labourer and the family had been living at Leigham Lane, Streatham. The 1861 census shows George was a plumber’s labourer living at 2 Smith’s Cottages, Leigham Lane and that Annie was working as a laundress. In that census Fanny was away from home. She was listed as a pupil in Herne. She was boarding there with her elder sister, Charlotte, who was a teacher. It has been suggested to us by a descendant of the family that Fanny may have been a pupil teacher rather than a pupil but we have no further information on this point. We note that at the time of his marriage in 1865 Thomas’s residence was given as Alveston Gloucestershire. 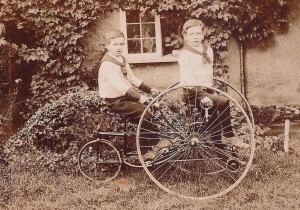 It seems that both Thomas and Fanny Fill taught at the National School in Alveston. He seems to have taught there for just one year before being appointed to the National School in Thornbury. The newsletter of the Society of Thornbury Folk tells us that the mangers of the school agreed to pay him £35 a year plus extra money in government grants based on performance and scholars’ fees. The children each paid 2d per week but of course the expenses of fuel, supplies and the payment of monitors had to be met. The newsletter tells us that Mr Fill was to “teach the usual subjects of elementary education for not more than twenty-five hours per week.” He was also to ensure that his wife taught the girls needlework and assisted him in the general management of the school, although we understand that she was paid separately. Nine more children followed at regular intervals and they were all baptised in Thornbury. The 1871 Census shows Thomas John Golding Fill aged 31 from Norfolk and his wife Fanny from Surrey aged 24 lived in School House. Fanny was described in the Census as a school mistress, despite having three young children: Lilian aged four, Eleanor aged three and Mabel Charlotte aged seven months. By 1881 Thomas and Fanny had additional help in the school as Lilian then aged only 14 was a pupil teacher. The family had grown to include Jessie (aged seven), Elsie (aged four), Fanny (aged two) and Amy (aged nine months). The family had a servant Annie Allen aged 14 to help cope with all these children. The 1891 Census shows that the family no longer had a servant living in the house but had two more children, sons Walter and Archibald. During his time at the school Mr Fill started a Drum and Fife Band. This band was very popular, and even played on annual choir outings to Weston-Super-Mare. The school was also inspected on behalf of the Gloucester diocese, mainly to ensure that the children were receiving a good Christian education. We have copies of some of these reports and they tended to be much more favourable. On 31st March 1905 Mr and Mrs Fill were presented with an illuminated address and handsome marble timepiece on leaving after almost 39 years service. They were presented with a marble clock and an illuminated address. The illuminated address is a printed poster with a photograph of the whole School, a list of all the scholars and teachers, followed by a photograph of the School house. Please click on the image on the left hand side to see a photograph of this certificate. The 1918 Electoral Register shows that the Fills continued living at the School House long after they had retired. They do not appear in the 1921 electoral register. This might be explained by the fact that when Fanny Fill died on 20th January 1922 aged 75 the burial register for Thornbury Cemetery shows that she was living at Ashley Grange, Bristol at the time of her death. Ashley Grange appears to have been a nursing home. Thomas Fill then went to live with his married daughter Eleanor and her husband Frank Adams at the White Hart Inn in Chipstead. Thomas Fill died there aged 83 on 4th April 1923. He was buried in Thornbury Cemetery on 9th April 1923 and the burial register confirms that he died at Chipstead. 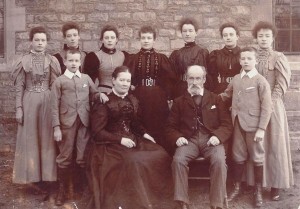 The photograph above shows Fanny and Thomas Fill in the front row. They are surrounded by their nine surviving children; the two boys, Walter and Archie and their seven sisters. Lilian Fanny Fill was baptised on 8th August 1866. By the Census of 1881 Lilian was a pupil teacher. By 1891 Lilian had left Thornbury and aged 24 she was an assistant teacher at Chipstead Elementary School at Reigate in Surrey. The 1901 Census shows that she was still an assistant schoolmistress at Chipstead and that she had been joined by her sister Eleanor who was also teaching there. The 1911 Census shows that the two sisters had continued to live together at The Ruffett at Chipstead and that Eleanor had become a dressmaker. The probate record shows that Lilian was residing at Yarleton, May Hill, Longhope in East Dean Gloucestershire when she died on 18th January 1945 although her address was given as The White Hart Chipstead in Surrey. Probate was granted at Llandudno. Her ashes were scattered at St Margaret’s Church, Chipstead following cremation at Cheltenham. Eleanor Annie Fill was baptised on 1st January 1868. The 1891 Census shows that she became a nursery governess and was living in the household of the Hussey family in Grove Park West, Westbury in Bristol. The 1901 Census shows that she went to live with her sister Lilian at The Ruffett at Chipstead where she remained until her marriage. By 1911 the Census shows that she had become a dressmaker. Eleanor married on March 30th 1913 at Chipstead in a double wedding with her brother Walter. Eleanor’s husband was called Frank Adams. Eleanor Adams died in Chipstead on 23rd December 1944. Jessie Golding Fill was baptised 13th July 1 873. The 1881 and 1891 Censuses show that she was living with her family until she married a railway engine driver Ernest Osborne Parsons on 1st June 1899 at Barton Hill. The 1911 Census shows that she and her husband lived at Bloomfield Road in Brislington, Bristol. Her death was registered in the Forest of Dean in 1941. Florence Yoell Fill was baptised 11th October 1874. The 1881 Census shows she was staying with her aunt Charlotte Browning nee Yoell who was a schoolmistress in Croyden. Florence was described as a pupil, presumably of Charlotte’s school. In 1887 the National School Log Book for Thornbury shows that Florence was being taught in Thornbury because she was recommended for a scholarship for the following year. The 1891 Census shows that Florence was still a pupil and living with her parents. Her death was registered in Hertfordshire in 1900. Elsie Margaret Fill baptised 31 December 1876. On December 31st 1888 it was noted that Elsie Fill was in delicate health and “faints occasionally when excited.” She never married and remained living at home with her parents. She died on 24th September 1920 aged 43. She was buried in Thornbury Cemetery on 28th September 1920. Fanny Maude Fill baptised 27th October 1878. In 1892 the inspection report of the National School showed that Fanny had failed as pupil teacher. Perhaps needlework was more her forte because in 1893 she got first prize for best made child’s frock. On the 6th March 1894 the National School log book has the school inspection report in which Fanny M Fill passed only a moderate examination and the comment was “general improvement expected next year.” On 18th December 1896 Fanny Maude Fill attended Fishponds Training College for Queen’s scholarship exam. On March 11th 1898 the Inspection report lists the school staff and says that Fanny M Fill is an “ex-pupil teacher”. However in May 1898 Miss Coombs, another teacher in the school resigned from her post and Fanny Fill was re-engaged. By 1899 she was recognised as a teacher under article 68, subject to her furnishing a satisfactory medical certificate. Fanny’s parents retired from teaching in Thornbury in 1905. By November of the following year she began to attend interviews for other posts. 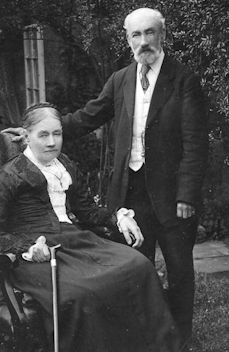 On December 21st 1906 she accepted a teaching post at Kempley. The 1911 Census confirmed that Fanny was an elementary head teacher aged 32 living at Kempley Dymock, Glos. She married Edgar Powell in the December quarter of 1913. Fanny Powell died in Gloucestershire in 1956 aged 77. Amy Browning Fill was baptised on 1 August 1880. Amy’s death aged only five years was registered in Thornbury during the December quarter of 1885. Beatrice Mary Fill was baptised on 27th April 1882. Her death was registered in Thornbury in the June quarter of 1882.
of the parchment “Walter Y. Fill has served me faithfully during his apprenticeship.” By the Census of 1911 he was a grocer’s shop assistant boarding at 38 Lichfield Grove, Finchley, London and he later went on to have his own grocer’s shop in Finchley. On 30th March 1913 he married Evelyn Adams at St Margaret’s Church in Chipstead. She was the daughter of William Daniel Adams a retired inn keeper of the White Hart Inn in Chipstead. After their marriage they lived at 10 Victoria Parade in Finchley. Walter enlisted in the Army Service Corps on 9th December 1915. He served in France April 1917 to June 1918. He was demobilised in July 1919. In 1945 when his sister Lilian Fanny died Walter was named as executor and his occupation was a stationer. Evelyn died in 1934 and Walter re-married, this time to Margaret Atkins in 1935. Walter died at the Memorial Hospital, Finchley on 7th May 1952 and his death was registered in Hendon. His second wife Margaret died in Clacton in 1998. Walter and Evelyn had two children, Walter John born in 1914 and Evelyn Eleanor, in 1915. John as he was always known eventually also lived in Thornbury where he taught at the Castle School, becoming Head of Maths. He died on 13th February 2000 and is buried in Thornbury Cemetery in the same grave as his grandparents Thomas John Golding and Fanny Fill and their daughter Elsie Fill. It is interesting to note that John Fill not only continued the family’s association with Thornbury but he left a lasting reminder of the Fill’s interest in the town. In 1964 he presented the school with the name plate of a Castle Class steam engine “Thornbury Castle”. The price paid at that time will surprise today’s locomotive memorabilia collectors as the name plate at that time cost only £15. On the right we have a thumbnail image of Walter and Archibald as children. Please click on it to see a slightly larger image. Archibald William Fill was born on 10th January 1885 and baptised 14th March 1885. The Censuses of 1891 and 1901 show that he continued to live with his parents in Thornbury. By 1901 Archibald had become a solicitor’s clerk. We know from his service record that he joined the Royal Navy as a ‘3rd Writer’ on 4th May 1905, initially signing on for a period of 12 years. At the time he was described as a Clerk, 5ft 8 3/4 inches, dark brown hair, grey eyes, pale fresh complexion with a large scar on muscle left arm. A “writer” in the Royal Navy was responsible for administration on board the ship, including legal matters, pay, welfare etc. The 1911 Census shows that Archibald had become a “second writer” on the HMS Cornwallis which was at Malta at the time of the Census. In 1916 the Dursley Gazette had a list of those serving in World War I who were entitled to Christmas presents for the troops. Archibald appears on this list and was said to be serving on HMS Caesar. At this time HMS Caesar was moored at Bermuda and was serving as a guard ship and gunnery training vessel. Archibald married Gwendoline Maria Reed in Bristol in 1918. He continued to serve in the Royal Navy and by 1926 had reached the rank of “Warrant writer.” To be eligible for Warrant Writer the candidate had to be a Chief Writer with five years’ experience as such and must be not less than 35 years of age. During his career he served on at least 12 different ships, some which were actually training depots and naval barracks. His probate record shows that died aged 72 in 1958 at his home in Wellington Hill West in Bristol. Gwendoline his wife survived him.